The EksoVest could protect assembly line workers from injury and strain. Assembly line workers often have to perform the same repetitive tasks all day long, making them susceptible to injury. But a new exoskeleton could offer some protection against fatigue and injuries. Dubbed EksoVest, the upper-body exoskeleton is designed to help workers lift heavy objects and perform over-the-head tasks. Looking like a high-tech back brace with arms, it elevates and supports a worker’s arms and can provide lift assistance for up to 15 pounds on each side. The exoskeleton was designed by Richmond, California-based Ekso Bionics, in partnership with Ford Motor Company. It’s being tested now at the automaker’s Michigan Assembly Plant and Flat Rock Assembly Plant. 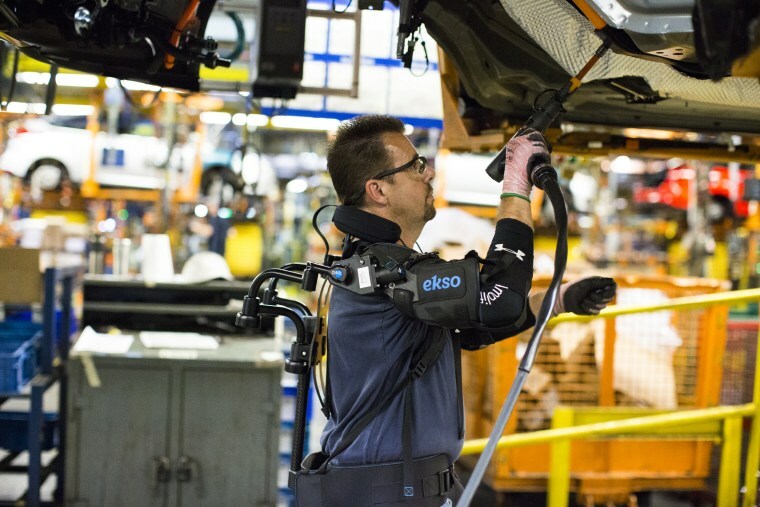 “Collaboratively working with Ford enabled us to test and refine early prototypes of the EksoVest based on insights directly from their production line workers,” Russ Angold, Ekso's cofounder and chief technology officer, said in a written statement. Assembly line workers at Ford lift their arms an average of 4,600 times per day, according to the company — and workers certainly feel the effects. The EksoVest can be adjusted to fit workers ranging in height from 5 feet to 6'4". Ekso Bionics says the exoskeleton can be used at construction sites or in distribution centers as well as in factories. And Ekso is not alone in trying to refine this technology. SuitX, a Berkeley, California-based startup, designed a workplace exoskeleton that redirects loads and provides lift assistance for construction workers and timber cutters. Other companies are developing robotic exosuits for people with mobility issues, senior citizens and the military.